The NV Franciacorta Brut is a standard 80-20 blend of Chardonnay and Pinot Noir. This is a crisp and luminous expression with a clean and direct delivery of crisp fruit, citrus and green apple. This approach is solid and refreshing. In the mouth, this sparkler offers silky perlage and an evident point of bright acidity. This wine is best for near-term consumption. Our first stop was Ronco Calino, an organic winery perched atop a hill with views of the surrounding vineyards and mountains. Its villa once housed noted classical pianist Arturo Benedetti Michelangeli, who chose the locale because it was ensconced in nature (he closely guarded his private life). Now it’s home to Lara Imberti Radici and her husband, Paolo, who started making franciacorta wines in 1996. Ronco Calino is one of the area’s smallest producers, churning out 60,000 to 70,000 bottles each year. Radici walked us through the winemaking process in the cellars and then gave us a tasting. For an introduction, try the refreshing, well-balanced brut, a wine typical of Franciacorta that has notes of red fruit and yellow flowers. Next, move onto the Nature (pronounced “nah-ter”), a smooth, dry pour with a touch of sharpness that offers an aftertaste of red fruit, citrus, light honey, vanilla, hazelnut and almond. Ronco Calino, Radijan, Franciacorta, Brut Rosé, NV, Italy. threads of bubbles, fine soft pink hue, raspberry and strawberry on the palate with zippy citrus notes and a lingering finish with a chalky note. Complex, lovely and refreshing. 100% Pinot Noir. and grown up just from the intuition of Franco Ziliani (1961 while working for Guido Berlucchi). It means just more than 50 years compared to the 400 years of history of the Champagne. 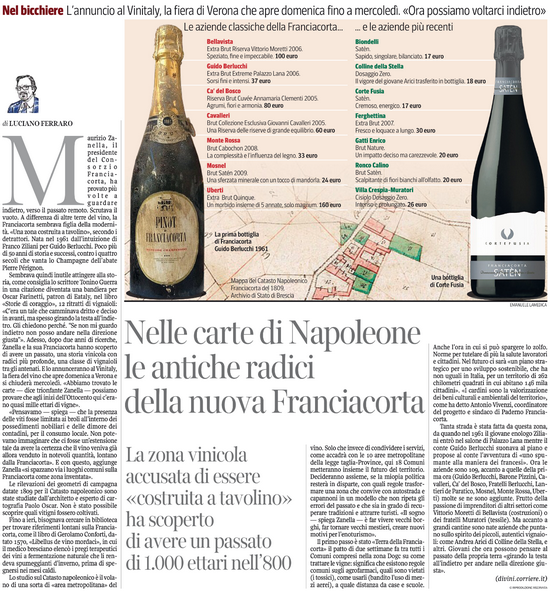 Finally the Consortium, after a long reaserch, has found maps dated 1809 belonging to the Napoleonic cadastre, that shows the presence of around a thousand hectares of vineyards in the current Franciacorta area.